At the beginning of the month I was sent a carrot ball from Equine-Innovations to review for you. This is a relatively new product and I’ve had my eye on it since I first came across it beginning of the year! What is the carrot ball? It is essentially an inflatable treatball. You put food (carrots, parsnips or similar sized treats) into the holes and can put it on the floor or hang it up. How easy is it for horses to get the treats out? When you give your horse a boredom busting toy like this, you don’t want them to be able to get the treats out straight away. However, at the same time, you don’t want it to be so difficult that they lose interest in the toy. The carrot ball addresses this problem really well by giving you plenty of options. 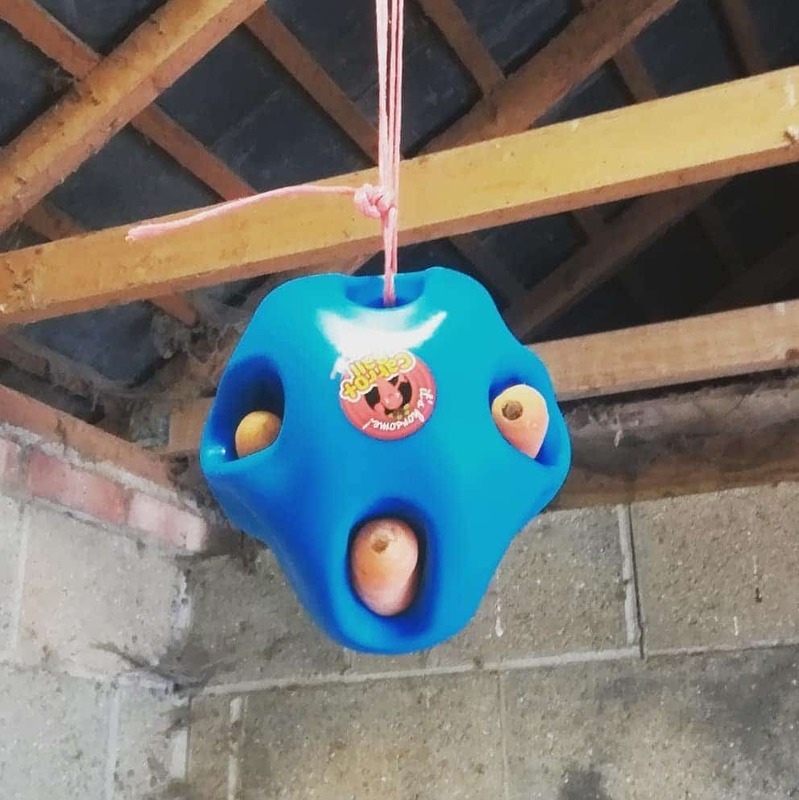 For horses which are easily bored or struggle to understand these types of toy, you can place the ball on the floor or hang against the wall. This makes it easier for them to get hold of the carrots. You can also have less air in the ball which makes it easier to pull the carrots out. If you have a greedy guts who tends to demolish treats quickly, you can hang the carrot ball from the ceiling away from the wall so that it is harder to get hold of the carrots. You can also inflate the ball more so that it is harder to pull the carrots out. Scottie loves a treatball or treat haynet. However, he was never been too interested in licks or non food toys like his jolly ball. So I was unsure what he would make of the carrot ball, especially when he came back to the stable with it already hanging up and waiting for him. But he investigated it straight away and knew there was food in there. While he struggled to get much out of it while I watched him play with it, when I came down in the morning two of the carrots were gone and the remaining carrot had been nibbled on. But this last carrot also disappeared the following night. I really like the carrot ball. It’s easy to use and you can leave it hanging up without food in it. Scottie still checks it every time he comes in from the field even when I haven’t topped it up. I also really like how it keeps him busy without giving him lots of sugar or calories. Since I hung it up, he doesn’t have to kick it around the stable to get the food out of it. So if your horse is on boxrest for lameness it could be a better option than a treatball. Plus some playful horses will enjoy playing with it even when it hasn’t got food in it. The only issue I have found so far is that if you different sized carrots, some will be held tightly in place whereas others may fall out fairly easily. So you need to choose carrots of the similar thickness each time you use it.